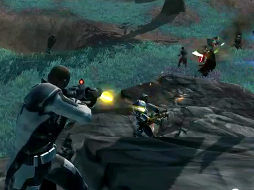 Bioware has released the newest trailer for SWTOR. This one focuses on the newest Warzone coming out in Patch 1.2…Novare Coast. The trailer showcases a very expansive and wide open looking Warzone. This should be an awesome map for Imperial Snipers and Republic Gunslingers to showcase their longer range. The minds of PVP players are already planning out tactics. What did you think of the trailer? How do you think this Warzone will differ compared to others? Let us know your thoughts on the new Warzone trailer.